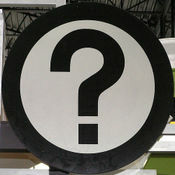 Yellow Tail wine's recent ad campaign displays this slogan: "Have you spotted it?" Through a secret source, I have smuggled the top ten rejected ad slogans, out of YT HQ. I think a few of these were definite winners..
From the Home Office in Beaver, Utah..
Is this single-varietal wine a Shiraz or something else? The Entry: An old-vines (allegedly really old vines) 2004 red w/screwcap from Australia's Barossa Valley. This deep, indigo wine offers initial scents of cedar chips and bacon fat. However, rather quickly, these nasal treats are overtaken by big, burly berry scents of blackberry preserves (some may say, "jam") with hints of black pepper and asphalt. In the mouth, this red Aussie wallops the tongue with hearty, shrivelly fruit flavors coupled to coffee and vanilla accents. Even though body-wise the wine is a big-un, it still possesses fairly balanced acidity (a nifty trick) and semi sandpapery tannins. All in all, as new world reds go, this wine is actually hospitible to food - the right food of course. Try it with mashed potatoes slathered in truffle butter and a medium rare, dry-aged slab of steak. So what say you, S[hi]yra[z]h or no S[hi]yra[z]h? Reminder: SLC folks can taste more wines like this at next week's, "Wines of the Future" class/tasting. Don't forget to sign up. It's only twenty-bucks! 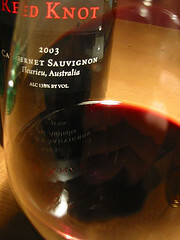 It seems every red Australian wine carries a typical scent signature. Whether it's Shiraz, Grenache, Mourvedre, or any of the permutations of "GSM" blends, I can nearly always sniff out an Aussie. The tell-tale scent can best be described as, "blackberry preserves, with a hint of pepper and dash of asphalt." Yes, asphalt isn't the most savory of descriptors, but I believe it aptly completes what my nose detects in most any glass of Aussie red. So the question is this: Does anyone else detect this Australian scent signature? Any hypotheses as to what actually causes it? Or is it just me? Red, Magenta, Have I Been Drinking? Hewitson Ned & Henry’s Barossa Valley Shiraz 2005 ($19, Australia) – All sun-loving Aussie Shiraz isn’t simply big and brawny. Ned & Henry’s Shiraz is an excellent example of winemaking talent from the super sunny southern hemisphere. Segura di Viudas Brut Rosé Cava, NV ($10, Spain) – Day-glo, magenta-colored bubbly! Crab cakes are calling. Or is that the best music video ever? 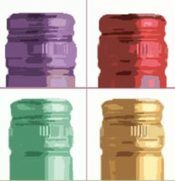 "Does Casella Wines [producer of Yellow Tail] add flavor enhancers to their yellow tail wine such as vanilla, almond, or cherry flavoring?" While I doubt such flavorings are added to Yellow Tail, I don't doubt a number of other flavor/aroma/color additives lurk beneath the smiling 'roo's exterior. So a question to any & all oeno-goeks (spelling just for Ali): What common additives are normally found in mass produced wines such as Yellow Tail? Yummy, isn't it?.. Peter Schell and his wife Magali Gely came to the Barossa from New Zealand, but their hearts are in France, where Gely's family still owns vineyards near Montpellier. Their wine, a dead ringer for a Chateauneuf-du-Pape, is rich and spicy, with a gorgeous core of blackberry, blueberry and plum fruit, shaded with smoky white pepper notes that keep ringing through the long, beautifully balanced finish. Tannins are there but well-submerged. Best from 2007 through 2016. 1. Is this wine indeed a "dead ringer" for a Chateauneuf du Pape? 2. Is the finish long and "beautifully balanced" ? Imported by the Australian Wine Connection (no Website); 56% Grenache, 26% Shiraz, 18% Mourvedre; 14.9% alcohol; 800 cases made. Deep indigo in color with a wide, bright pink rim. The wine nearly defies gravity by clinging to the sides of the glass after swirling. The initial, overwhelming scent is of fresh concord grape juice. After 15-20 minutes of air time, the wine evolved scents of blackberry jam, dates, hints of Pernod (licorice/anise-flavored liqueur) and notes of black pepper. 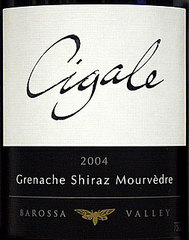 In the mouth, Cigale is very full-bodied and full of cooked berry flavors. It possesses soft, round tannins that stay in the background due the intense flavor and alcoholic heft. The finish is indeed long. However, I found the wine slightly hot (alcohol overpowers acidity) on the finish - not terribly balanced. I paired Cigale GSM to a roasted Portobello burger with mozzarella and artichoke aioli. The wine was a bit too hefty for food. If you enjoy extraordinarily big, intense Aussie reds, this might be a wine for you. As to my taste, I found it too overbearing - not recommended. However, I did notice that this wine was far less overbearing on day two. One suggestion for these types of wines is to decant them and let them breathe for several hours before serving. 1. I didn't find this wine to be a dead ringer for C. du Pape. It does have some similarity to 'modern', youthful C.d.P.s. However, I didn't detect any meatiness or herbs - which for me is always part of great du Pape. 2. The finish is quite long. However, I didn't find it to be well-balanced. It was definitely hot due to the high alcohol-to-acidity ratio. "My take on the wine would be definitely a full fruit flavour. Lots of cherry/blackberry flavours hit you in face as soon as you take that first sip, and linger until you’re ready for the next. It’s definitely full bodied. Not the kind of wine that you can drink nonchalantly… It’s big flavoured and makes you sit up and take notice. The subtle nuances and flavours of the wine are lost on me I must admit, and being an avid coffee drinker/roaster, I didn’t pick up on the roasted coffee flavour as described in the wine makers notes." In fact, I found Matt's review of this wine quite informative and refreshing. He's not playing to the wine geek crowd. Rather, he has simply written about something he enjoyed drinking. What a concept! Cheers, Matt - and keep the wine reviews coming. 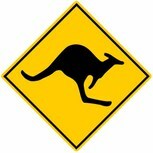 Also, seeing as how you live in Western Oz, perhaps you might introduce us to some of the wines from this region? Just keep in mind, we are in the midst of an Aussie wine glut, so all the marketing stops, including creative critters, are going to be trotted out. Prepare to be bombarded by clerverly named & labeled wine that must be sold!